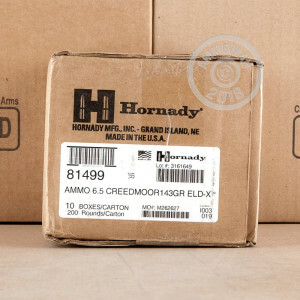 This 6.5mm Creedmoor cartridge from Hornady’s Precision Hunter line of ammunition features a 143 grain ELD-X (Extremely Low Drag) projectile. The bullet’s pointed Heat Shield tip is virtually immune to aerodynamic heating, which along with its secant ogive profile, boat tail design, and extremely concentric jacket grants it match grade accuracy. 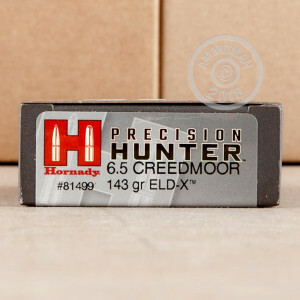 This bullet is designed to be effective over a great range of distances: At high velocities under 400 yards its thick shank and InterLock ring prevent core/jacket separation to provide up to 60 percent weight retention, and at lower velocities over 400 yards its tip is driven into its core to provide up to 90 percent weight retention as it expands dramatically. 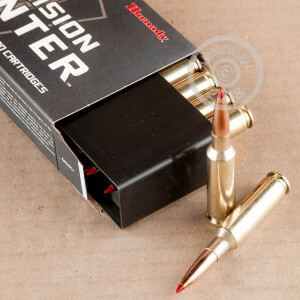 This round’s amazing accuracy and devastating terminal performance are complemented by its clean burning and uniformly loaded propellant, which assures consistent chamber pressures no matter the temperature of the environment you’re hunting in. Along with its high quality brass casing and sensitive primer, fewer rounds are poised to deliver as much as this one during your next hunt.